Solar panels at The Merc Co+op in Lawrence, KS. Photo courtesy of Cromwell Solar. Food co-ops are responding to climate change and demonstrating the environmental leadership their members and shoppers expect. Because food co-ops are owned and operated by their shoppers, the projects they pursue are as unique as the local communities they serve. Check out a few inspiring examples from food co-ops across the country and learn about how food co-ops are working together nationally to improve their collective carbon footprint. As grocers, refrigeration is essential to food co-ops’ business but it is also a tremendous liability for climate change, if improperly managed and maintained. In fact, the number one solution identified by researchers to slow climate change is improved refrigerant management. Refrigerants are the gases used by refrigerators to freeze and chill food, cool buildings and machinery—and they’re up to 9,000 times more potent greenhouse gases than carbon dioxide. Additionally, refrigerators account for the largest percentage of the energy a grocery store uses. City Market/Onion River Co-op in Burlington, Vermont has aggressively reduced the impact of refrigerants in their stores with new state-of-the-art refrigerators that utilize carbon dioxide as a refrigerant—thousands of times less environmentally destructive than other refrigerants. They have been nationally recognized by the U.S. Environmental Protection Agency (EPA) GreenChill program for their success in reducing refrigerant emissions. PCC Community Markets, the nation’s largest community-owned food market, is headquartered in Seattle, Washington and has 11 locations. They’ve been installing doors on the refrigerated cases at the ends of their aisles, which is uncommon in the industry but a big improvement for refrigeration efficiency. Cook County Whole Foods Co-op in Grand Marais, Minnesota uses the heat generated by their refrigerators (which is typically substantial in any store) to heat the store’s hot water supply, effectively offsetting some of the energy consumed by refrigeration by reducing their need for heating fuel. Renewable forms of energy like solar and wind power hold huge potential for slowing climate change—solar farms and rooftop solar installations are ranked highly by researchers as solutions worth pursuing to slow global warming. For this reason, many communities have chosen to pursue solar power solutions to meet their food co-ops’ energy needs. Community Food Co-op in Bellingham, Washington uses a combination of solar panels and renewable energy credits (RECs) to supply 100% of their energy, with a 2% surplus that goes back “into the grid” for their community to use. They’ve received many awards, including a National Co+op Grocers Climate Collaborative award in 2018. 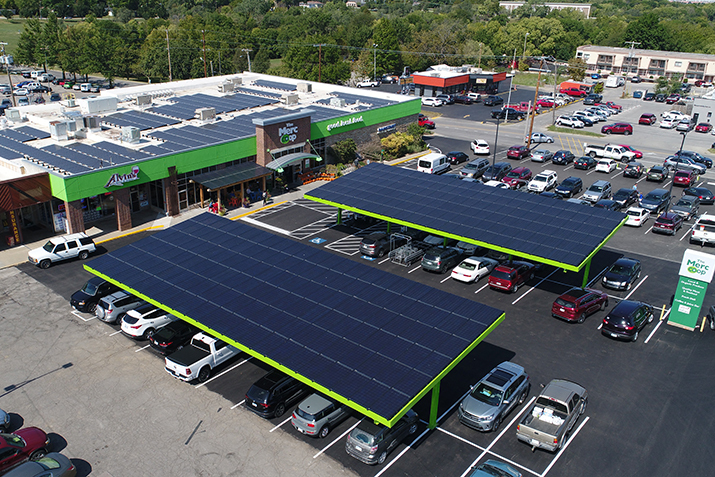 BriarPatch Food Co-op in Grass Valley, California and The Merc Co+op in Lawrence, Kansas have installed massive solar projects covering their stores and their parking lots. Viroqua Food Co+op in Viroqua, Wisconsin added a large solar installation when they expanded in 2018, and Monadnock Food Co-op in Keene, New Hampshire, installed solar energy using a community supported solar model. Food waste is a huge loss in terms of the agriculture, energy and labor needed to produce, transport and prepare it—but when it ends up in a landfill, it really takes an environmental toll. Rotting food releases methane—a highly potent greenhouse gas. Reducing food waste ranks third among potential solutions to climate change. This is a priority that many food co-ops are working to improve. Lexington Cooperative Market in Buffalo, New York, has an efficient system for donating healthy food to their local food pantry each month, donating many more pounds of food than the average grocery store. Outpost Natural Foods Co-op is a food co-op with four locations and a market café in the Milwaukee, Wisconsin area. They’ve found a local composter to pick up food scraps and compostable materials from their stores. The best part? They are able to sell their very own co-op compost to gardeners in their community—closing the loop on food waste and preventing it from ending up in the landfill. Dozens more food co-ops have been honored with Sustainability Star Awards for projects big and small. Food co-ops are working together nationally through their own business cooperative, National Co+op Grocers (NCG)* to track their impact and report on sustainability. Co-ops measure refrigerant gas leaks, energy use, food waste, diversity, wages and benefits and more. They also share best practices and ideas in pursuit of continual improvement. Food co-ops have also taken a strong position within the natural products industry (see our annual climate leadership awards) to encourage companies to make bold progress on climate change. Through NCG, co-ops are growing and protecting rainforests in Peru that are part of the chocolate and coffee supply chain (Co+op Forest). Learn more about how our food system and climate change are connected. *National Co+op Grocers is the national cooperative that runs this website.